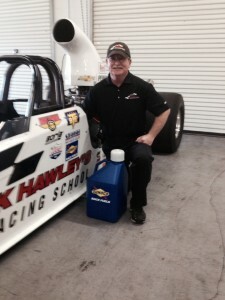 Feb.17.2015Sunoco Race Fuels Joins Frank Hawley’s Drag Racing School! Sunoco Race Fuels will help to power every race car at Frank Hawley’s Drag Racing School in 2015! “We are excited that Sunoco will be working with us to provide a quality product so our customers can be assured of strong, consistent performances whether they are behind the wheel of one of our Adventure Dragsters or blasting down the track in a Top Alcohol Funny Car! The Chevy engines in the school’s Super Comp and Super Gas cars will be burning Sunoco 110, while the Alcohol cars will be powered by Sunoco Methanol and Southern Racing Fuels will be making sure plenty of product is on hand for every driving course. If you’re interested in feeling the power that Sunoco Race Fuels can produce…call Frank Hawley’s Drag Racing School and experience it!